Addressing the National Assembly Dec. 7, the minister accused opposition members of being “quite selective” in what they reported to the Honourable House from the International Monetary Fund (IMF) report on the 2017 Article IV Consultation with St. Kitts and Nevis, which concluded June 2. In the same report, the IMF commended the Team Unity-led administration of St. Kitts and Nevis for its competent and prudent management of the economy, the necessary reforms to strengthen and protect its Citizenship-by-Investment (CBI) Programme, plans to introduce universal health coverage and the commitment to establish a Growth and Resilience Fund (GRF). “Mr. Speaker, the very same report [under the section] ‘St. Kitts and Nevis Key Issues Context’ said ‘St. 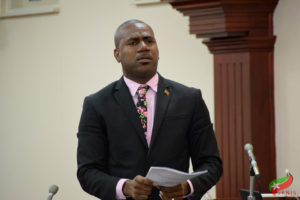 Kitts and Nevis attained the strongest growth and fiscal performance in the ECCU region in recent years.’ The report also says that, but, of course, Mr. Speaker, they do not want the public to do know that,” the member for St. Christopher Five added. The deputy prime minister also referenced the World Economic Outlook, dated October 2017, which also backed the 3.5 percent economic growth projected for St. Kitts and Nevis in 2018 by the IMF. Prime Minister and Minister of Finance the Hon. Dr. Timothy Harris said in his 2018 Budget Address Dec. 6 that this positive projection will be driven by the continued developments in the construction and tourism sectors, as well as the transportation, storage and communication, and financial services sectors.